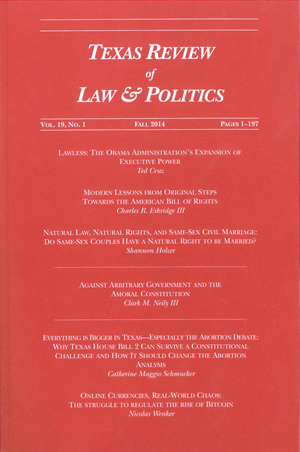 The Review, published at The University of Texas School of Law, is one of the nation's premier conservative law journals. Its mission is to be the prime forum for the discussion and debate of provocative legal issues such as criminal justice, federalism, affirmative action, constitutional history, and religious liberties. In its short history, the Review has caught the attention of the judiciary, legal scholars, and the popular media. Justice Scalia cited the Review in DC v. Heller and the Michigan Supreme Court cited the Review in a majority opinion calling for judicial restraint when courts are asked to modify legal rules. The Review has also been cited in briefs to the Supreme Court in many of the most influential cases of our time, including Grutter v. Bollinger, MGM Studios v. Grokster, and Kelo v. City of New London.